Hello and Happy Tuesday! Did you watch the Solar Eclipse yesterday??? It was really cool and actually more exciting than I expected it to be! My favorite part was that as it started getting dark the crickets started making noise and the lighting bugs started coming out! Now that was cool! 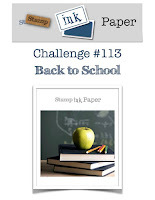 So since it is Tuesday you know that means it's time for another Stamp, Ink, Paper Challenge! This week's theme is back to school! 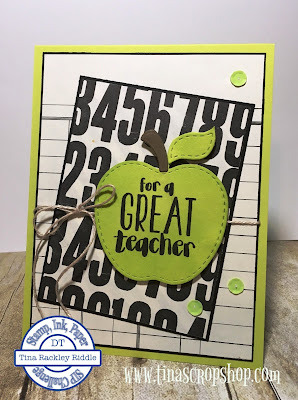 Time to pull out my cool Lil' Inker Designs Apple of My Eye stamp set and coordinating Apple Shaker Die Set for this one! Luckily for me I had some retired DSP that had the cool black and white designs that worked awesome for this theme! I used Stampin' Up! Lemon Lime Twist for the base as well as the apple and leaf. The DSP has skinny mats in Basic Black cardstock. Thanks so much for stopping by! This card is great in so many ways, Tina! Love it.